Daly Waters is located 274 kilometres south of Katherine near the junction of the Stuart and Carpentaria Highways. 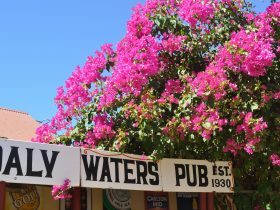 Despite the tiny population of the settlement, the Daly Waters’ Pub is one of the Territory’s most famous watering holes. 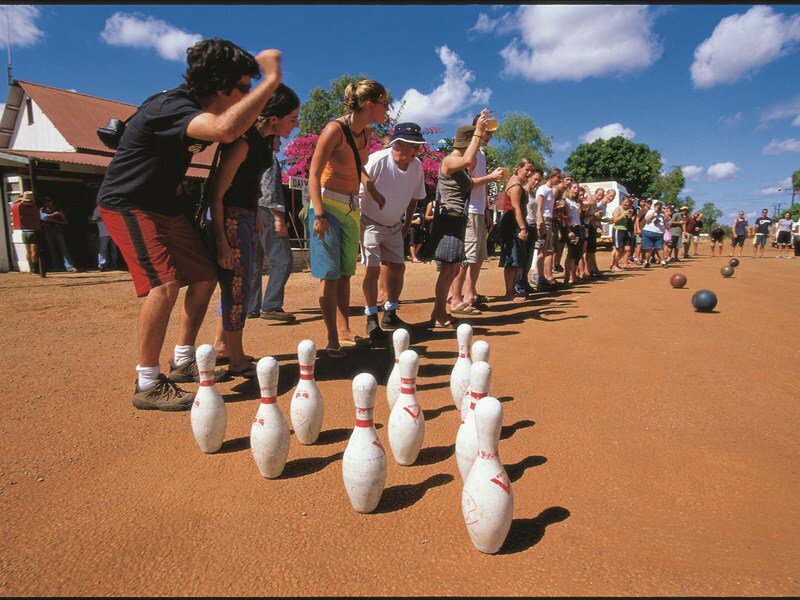 One of the oldest buildings in the Northern Territory, the pub is a quirky place clad in corrugated iron and crammed with decades of memorabilia. The annual Daly Waters rodeo is an institution not to be missed. Daly Waters also has a rich and interesting aviation history, being the centre for the London to Sydney air race of 1926, a World War II air force base and a refuelling stop for Qantas. The Daly Waters hangar exhibits interesting facts, photographs and equipment from the area’s former aviation glory days. The Jingili people, the traditional Aboriginal owners of the area, believe the Dreaming tracks of the Emu and the Sun travelled through here on their way to the southern parts of the Northern Territory. In 1862, after two unsuccessful attempts to cross the continent, early explorer John McDougall Stuart finally discovered water in this region. He blazed an ‘S’ in a nearby tree to signify his important find. Daly Waters is a small Northern Territory Rural Location within the local government area of Roper Gulf, it is located approximately 502kms from the capital Darwin covering an area of 4.967 square kilometres. Daly Waters has a recorded population of 9 residents and is within the Australian Central Standard Time zone Australia/Darwin. If you are planning a visit to Daly Waters we’ve put together some of the things nearby that you can see or do while you are here. These include, places to stay, tours and attractions, some upcoming events and places where you can grab a meal. Go ahead, try one of the buttons above. Every destination has something worth seeing so start exploring… If you know Daly Waters and think we’ve missed something, let us know and we’ll share it here.